What to do with Trader Joe’s cookie butter? How should I eat cookie butter? What can I make with cookie butter? Look no further. Here’s an alarmingly addictive snack of cookie butter coated Chex cereal dusted with powdered sugar. Quick and easy to make, and even quicker and easier to eat the whole batch. Nutella is so 2012. You want to be current? You want to be trendy? Cookie butter is where it’s at. And I’m just kidding… nutella is still pretty darn good and I have a half-eaten jar of it in my cabinet right now. But cookie butter has been getting a whole lot more love in our household lately. It’s made appearances in this Crack Pie with Speculoos. And then in these Pretzel Coated Cookie Butter Truffles. And if Asheley has the house to herself all day, it’s not unusual for her to fix herself a glorious breakfast (and lunch) of animal crackers dipped in cookie butter. I’m a proud husband. 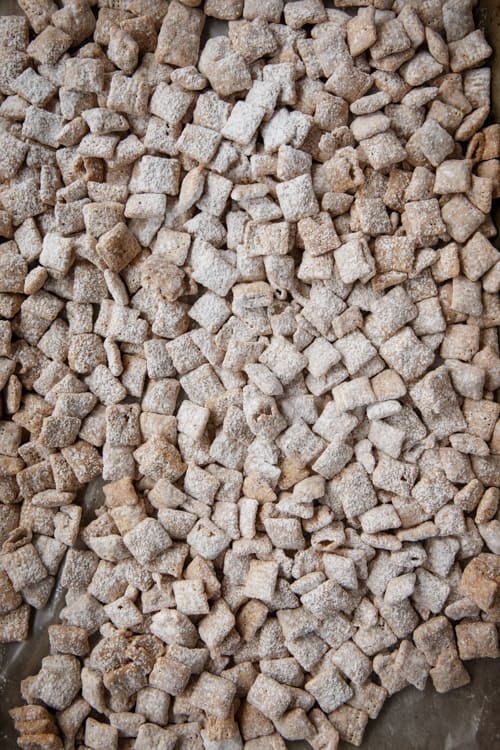 I have been seeing a lot of puppy chow and muddy buddies floating around the food blogosphere lately. Not being from the Midwest (where apparently the stuff is most readily consumed), I had absolutely no clue what they were talking about. But it looked sinfully good and something I needed to consume immediately. I’m just going to warn you know. It’s habit-forming. 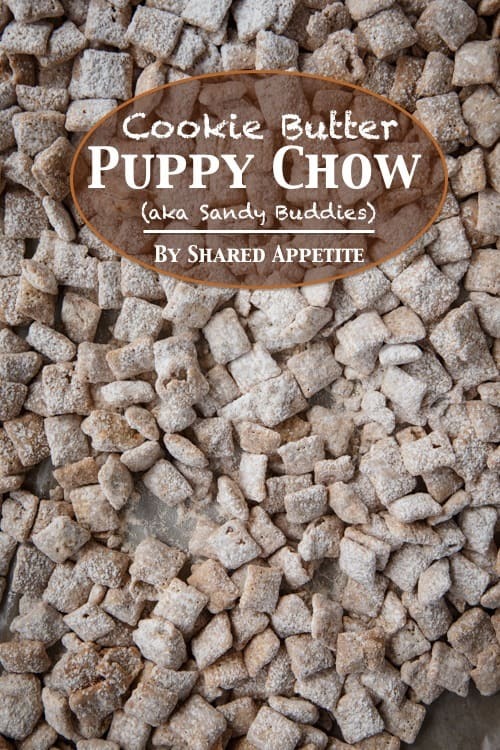 You will have a growing dependency on this Cookie Butter Puppy Chow. Don’t blame me. I’m just the messenger, bringing good tidings of great joy. No, you can’t feed this to your dog. I know, the name is deceiving. I just wanted to put that disclaimer front and center so I don’t get any angry emails about how this Cookie Butter Puppy Chow made their dog sick. But do you know who you can feed it to? 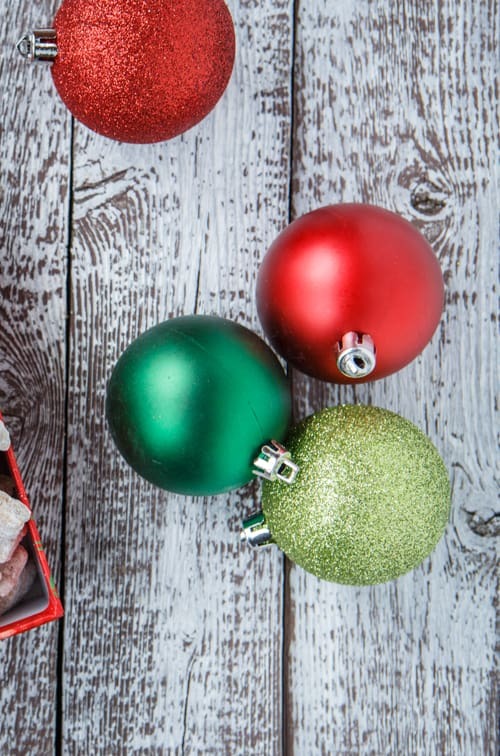 Your friends, family, coworkers, neighbors, strangers, that girl you’re trying to impress, and… well, if you want to go down as a legend this Christmas season, start bringing it to holiday parties. Little do people know it literally takes 10 minutes of minimal effort to make a batch. Sshhh, it’s our little secret. 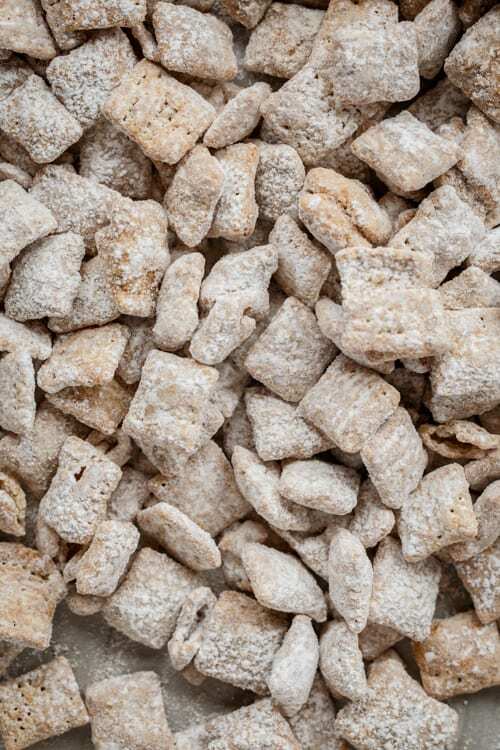 Puppy Chow is also sometimes called Muddy Buddies. And usually instead of cookie butter and cinnamon chips, they employ the classic peanut butter with chocolate chips flavor combination. So get it? Melted chocolate… muddy buddies. Cool. 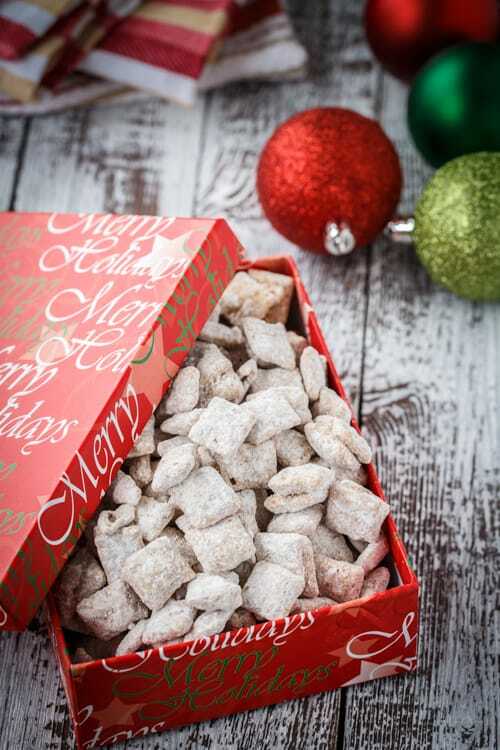 Since we are sans chocolate in this recipe (a variation acceptable according to Puppy Chow law), we need to use the alternative name, Sandy Buddies. Why is this snack/dessert/treat so highly addictive? It’s pretty much like Cinnamon Toast Crunch on steroids. You have the crunch of the Chex cereal, which is coated in this cookie butter flavor-explosion concoction, and then covered in a fog of powdered sugar. And for those of us that don’t know what cookie butter is, don’t feel bad. I, too, was once in the darkness. Cookie butter is Trader Joe’s (the grocery store) version of Biscoff Spread or Speculoos. And sure, this recipe could be called Biscoff Spread Puppy Chow or Speculoos Puppy Chow, but Cookie Butter is probably more readily available to us general public folk here in the USA than the other two. But hey, if you have access to Biscoff Spread or Speculoos, feel free to use it. Trying to fully capture the essence and flavor of cookie butter/speculoos/biscoff spread is near impossible. You know I’m a music teacher by day, right? Well there is this famous music quote by Victor Hugo that is hanging on my classroom wall and states, Music expresses that which cannot be put into words and that which cannot remain silent. Good quote, right? You know where I’m going with this. You can just go ahead and substitute the words cookie butter in there for music and we’re good to go. It’s got a peanut butter consistency, but tastes reminiscient of gingerbreadish-shortbreadish cookies. I don’t want to say straight up gingerbread because I honestly don’t even like gingerbread cookies all that much. It’s just really good. You just need to try it. Do it. Now. And if you ever see Biscoff Spread or Speculoos (or if your Trader Joe’s quickly sells out of Cookie Butter), it would be wise of you to hoard the crack-like substance to the point where you might need an intervention. When Asheley and I honeymooned in Paris a couple years back and took a day trip to Brussels, we literally cleared a supermarket of every single jar of Speculoos they had… so we still have a few jars lingering in our pantry I’m sure. Place Chex cereal in a large bowl. In a separate small bowl, microwave the cookie butter, butter, vanilla extract, and cinnamon chips on half power in 30 second intervals, stirring between each, until mixture is melted and smooth. Scoop melted cookie butter mixture on top of Chex cereal and very gently mix to combine, being careful not to crush the cereal (I used my hand to accomplish this feat). Place cereal mixture and powdered sugar in a large plastic bag (a clean kitchen garbage bag will do), hold the top firmly closed, and shake like crazy. Feel free to do a little dance as well. That helps. Chris, this is brilliant. So delicious! I want it now! oh my God you are killing me…and my kids would probably go nuts over this stuff. Ahhh…back to the store for some chex now!!! Seriously Chris, next time just make me up a shopping list in the beginning of the week. Hey what type of chex did you use? I like where you’re going with all these cookie butter treats! haha I had to stop making muddy buddies years ago since I could eat wayyyy too much in one sitting (and couldn’t stop). And now you’ve got me considering making a batch … with cookie butter obviously! I’m glad we’re on the same page Ashley! I can totally see why you needed to cut yourself off cold turkey. This could get out of control easily and quickly! You are KILLING it with the cookie butter recipes. I didn’t make it to Trader Joe’s last weekend, but this is it, I’m going and I’m a jar or two or three…or four. AND as luck would have it I have all kinds of chex in the pantry, so I WILL be making this before said cookie butter in inhaled. I am so obsessed with cookie butter and Nutella. I have 3 large size jars of Nutella in my pantry and 5 jars of Biscoff. Yep, I love them and I love this puppy chow. Such a great way to incorporate cookie butter! Nicely done Chris. Such a simple recipe! Awesome! 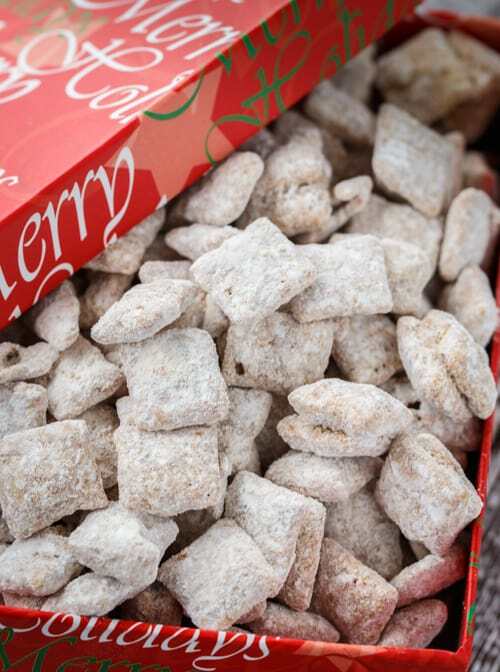 THANK GOD someone finally explained the whole freakin’ puppy chow thing. I have seen tons of “chow” pins and someone even left a comment on my FB page about wanting “chow recipes” and, frankly, I was just freaked out. 🙂 I think I’d be open to anything made with Biscoff spread, as I’m a serious addict. Haha glad the mystery has finally been solved! I was the same way… kept seeing pins for it and was like, what is this stuff?! Such a great snack, how do I stop eating it though?! Also how wonderful would this be to give away as gifts? Whyyyyyyyy did you do this to me Chris?! I have been trying with all my might to avoid buying cooking butter ’cause I know I will just face plant right into the jar and never get myself out. But, I love puppy chow. Like, it’s borderline obsession. Now, I have to give in. I hate you and I love you for posting this. I want it in my face right now please. Taylor, you know your attempts to thwart your cookie butter consumption is futile at best. Don’t be hard on yourself, though. I blame the cookie butter. I swear they put mind-controlling substances in their jars to make us keep going back for more!